Football season is here and our family loves the Dallas Cowboys. I love to watch football with the men of my house. 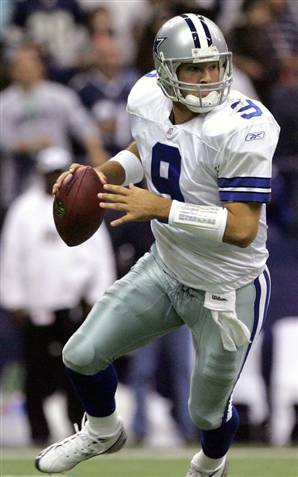 The quarterback is the primary playmaker on the team and sets the game in motion. Digestive enzymes are like the quarterback in the digestion game in our gut. They get the ball rolling and involve the entire team in reaching the goal…digestion of foods so our bodies can get the nutrients to thrive on. Digestive enzymes are needed to completely break down the foods and peptides for several reasons: to reap the all the nutrients in the food, and so the bad bacteria or yeast don’t have more food to eat and grow on. Our body naturally produces digestive enzymes to break down foods before they start their trek through the intestines. We have enzymes in our saliva that aid in food breakdown. These enzymes are amylase, which break down carbohydrates along with our chewing of the food. Next stop is the stomach where stomach acid, muscles and the enzyme pepsin, breaks down proteins and work on the food for approximately an hour before it continues to the small intestine. Our small intestines release enzymes as well as our pancreas. Enzymes released in our small intestines are lactase (breaks down milk sugars), DPP IV (breaks down the milk and other protein bonds), and disaccharides (breaks down starches and sugars). You can see that digestive enzymes have a lot of work to do and without them, our bodies cannot function properly just like a football team can’t function without its quarterback. Enzymes are required for your body to function properly because without enzymes you wouldn’t be able to breathe, swallow, drink, eat, or digest your food. Our cells won’t get the glucose for energy, amino acids for protein and toxins wouldn’t be removed from our blood. Poor dietary habits, fast food consumption, and excessive intake of fat and sugars, all require excessive amounts of enzymes to digest our foods. Over eating foods that are void of enzymes (processed pre-packaged foods) and eating too much food results in a depletion of enzymes in the body. In particular, there is strain put on the pancreas to secrete greater amounts of enzymes than normal. The result is an exhausted pancreas. To reduce the load on the pancreas, the immune system lends its white blood cells which have stores of enzymes to aid in the digestive process. The result of this is impaired immune function. By ensuring our body has sufficient enzymes not only supports the digestive process, but the immune system as well. Eating a food or food group too frequently will also contribute to an enzyme deficiency. Foods that are more likely to cause allergies/sensitivities are the ones that are consumed the most: eggs, wheat/gluten, milk, corn and soy. When these foods are consumed several times a day for years it creates an enzyme deficiency for that food and the body can no longer break down the proteins or starches and causes a reaction when the peptides enter our bloodstream. When food is properly digested, it is broken down into substances that the body recognizes and can utilize. If food molecules are not broken down into their smallest form (by enzymes) when they enter the bloodstream the body recognizes them as foreign invaders and attacks. When the body no longer can handle the overload of food that it cannot properly digest and utilize, the result is food allergies and intolerance, indigestion, gas, bloating, heartburn, constipation, and diarrhea. There are other symptoms of our body’s imbalance from incomplete digestion such as asthma, environmental allergies/sensitivities, candida over-growth, arthritis, obesity, eczema, fatigue, headaches, and hyperactivity. One digestive enzyme that tends to be insufficient in a lot of ASD kids, as well as kids with ADHD, is DDP4 (dipeptidyl peptidase-IV). This enzyme is found in the gut and is responsible for breaking a bond between amino acids in peptides formed during protein digestion. Problems occur when there is a lack of DDP4 which causes incomplete digestion of the gluten (wheat) and casein (dairy) molecules, leaving a mischievous peptide. In the case of damaged or leaky guts, these peptides called gluteomorphin (gluten) and caseomorphin (casein) can pass into the blood, where they do harm because they evoke an immune response. They can also mimic endorphins that cause changes in perception, mood, and behavior. This is one reason why the gf/cf (gluten-free/casein free) diet is so effective in reducing behaviors in kids with autism. It’s the elimination of the offending peptides from the diet. When one supplements digestive enzymes, plant derived enzymes are the most effective. 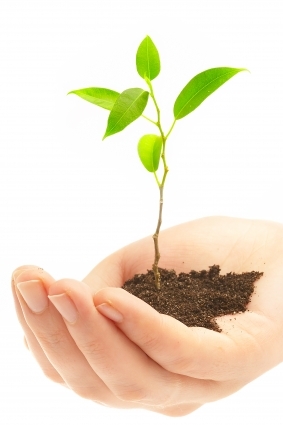 They are obtained from the lysosomes of live plant cells. They are more effective because they can survive the acidic environment in the stomach and different PH levels in the small intestines. Animal derived digestive enzymes that mimic our pancreatic enzymes only survive in the alkaline environment of our small intestine. In order to keep our digestive and overall health at its best, eating more raw vegetables, nuts, and fruits is important. Papaya and pineapple are the best sources of foods that contain naturally occurring digestive enzymes. Papaya contains the naturally occurring digestive enzyme papain, which helps to digest protein. Pineapples contain the digestive enzyme bromelain, which acts as an aid for indigestion. Pineapples also contain multiple anti-inflammatory enzymes. Mangos, watermelon, blueberries, raspberries and grapefruit also contain naturally occurring digestive enzymes. Parsley, kale, broccoli, celery, cabbage and beets and beet greens are excellent choices for raw vegetables that contain naturally occurring digestive enzymes. Wheat grass and aloe vera juice contain a lot of enzymes. 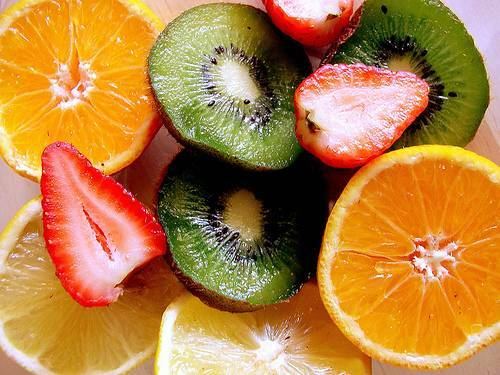 All raw food contain digestive enzymes; naturally fruits and vegetables are excellent sources. Some smart fruit choices are fresh apples, figs, pears, cherries, peaches, strawberries and apricots. 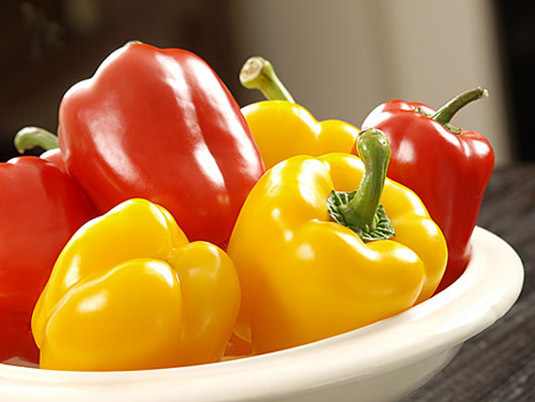 For vegetables, all of the bell peppers: red, yellow, green and orange, as well as tomatoes, are excellent choices. Balancing your meal with raw foods in addition to cooked foods can assist your body in the digestive process, just as the quarterback balances out the game with running plays, passing or handing off the football. For example, a salad or raw veggies along with your steak or chicken breast will help ease the demand on your body to release digestive enzymes since the veggies in the salad contain enzymes. Same goes for the quarterback when he hands the football off to the running back; which saves his throwing arm and reduces the risk of interceptions. For more information on using digestive enzymes for your child, refer to my page on enzymes. Everyone in our family takes a magnesium supplement in addition to the magnesium we get from our diet. Magnesium is an essential mineral, which means our body needs it to function. We get it from our diet or with supplements. Lack of magnesium may lead to irritability, muscle weakness, and irregular heartbeat. Every organ in the body — especially the heart, muscles, and kidneys — needs the mineral magnesium. It also contributes to the makeup of teeth and bones. Most important, it activates enzymes, contributes to energy production, and helps regulate calcium levels as well as copper, zinc, potassium, vitamin D, and other important nutrients in the body. Certain medical conditions, however, can upset the body’s magnesium balance. For example, an intestinal virus that causes vomiting or diarrhea can cause temporary magnesium deficiencies. Some gastrointestinal diseases (such as irritable bowel syndrome or IBS and ulcerative colitis), diabetes, pancreatitis, hyperthyroidism (high thyroid hormone levels), kidney disease, and taking diuretics can lead to deficiencies. Too much coffee, soda, salt, or alcohol as well as heavy menstrual periods, excessive sweating, and prolonged stress can also lower magnesium levels. Children on the autism spectrum tend to be low in magnesium due to digestive issues and diet. Fibromyalgia – A small preliminary clinical study of 24 people with fibromyalgia suggest that a proprietary tablet containing both malic acid and magnesium may improve pain and tenderness associated with fibromyalgia when taken for at least 2 months. Other studies suggest the combination of calcium and magnesium may be helpful for some people with fibromyalgia. Magnesium has been shown to relieve muscle pain and fatigue in individuals with Fibromyalgia. Migraine headache – A few studies suggest that taking magnesium supplements may help prevent migraine headaches. In addition, a few clinical studies suggest that magnesium supplements may shorten the duration of a migraine and reduce the amount of medication needed. People who have migraine headaches tend to have lower levels of magnesium compared to those with tension headaches or no headaches at all. Some experts suggest combining magnesium with the herb feverfew along with vitamin B2 (riboflavin) may be helpful when you have a headache. Type 2 Diabetes – It is estimated that up to 80 percent of those with type 2 diabetes have a magnesium deficiency. High glucose levels, in patients with Type 2 Diabetes, will cause the body to flush magnesium from its system. In a recent study, people with diabetes who took magnesium supplements had improved insulin and glucose levels. Heart Disease – “Magnesium does a heart good”. People with heart conditions, including heart attacks, high blood pressure, abnormal heart rhythms and coronary artery disease, tend to be magnesium deficient. Studies show that people with low amounts of magnesium in the body have double the risk of developing coronary heart disease, and that magnesium supplementation can lower cholesterol by as much as 20 percent. Magnesium supplementation can increase individuals’ magnesium levels and minimize the risks associated with heart disease. A diet high in fat may cause less magnesium to be absorbed. Cooking may decrease the magnesium content of food. Diets that provide plenty of fruits and vegetables, which are good sources of potassium and magnesium, are consistently associated with lower blood pressure. The DASH study (Dietary Approaches to Stop Hypertension) suggested that high blood pressure could be significantly lowered by a diet high in magnesium, potassium, and calcium, and low in sodium and fat. Evidence suggests that magnesium may play an important role in regulating blood pressure. The U.S. RDA of magnesium intake for children 4 – 10 yrs is between 120 – 170 mg/day; adults between 270 – 400 mg./day. 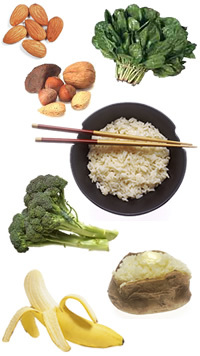 To supplement your diet with magnesium, there are various forms of magnesium to choose from. TYPE OF MAGNESIUM: Magnesium citrate, oxide, glycinate, and sulfate. For constipation, people use magnesium citrate, but for a good supplement for bodily functions without diarrhea, we use magnesium glycinate. When given an Epsom salt bath, the magnesium and sulfate in the salts are absorbed into the body through the skin. Sulfate is thought to circulate in the body up to about nine hours. Any Epsom salts left on the skin may continue to be absorbed as long as it is still on the skin, offering continuous ‘timed-released’ input into the bloodstream. I put 1.5 to 2 cups of Epsom salts in hot bath water to dissolve and then add the cold water to balance the temperature. Soak for about 15 minutes before using natural soaps or shampoos. Others add baking soda and lavender oil to enhance the relaxation effects. You can also do a foot bath of hot water and Epsom Salts for 15 minutes while watching TV/reading before bed. I have heard parent’s success stories about helping their child with autism recover with diet and the healing benefits of coconut kefir. So I researched it and found that it is a rockin’ probiotic drink and offers much more than good gut health. Here is the dish on this hard to find, expensive drink. 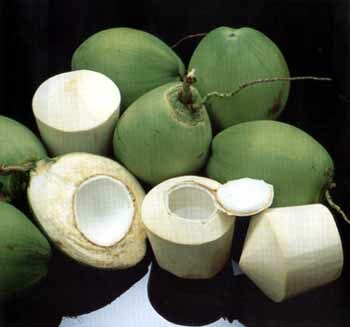 True coconut kefir is derived from young, green, coconuts from Thailand. (1st obstacle in making this drink) The coconut water is combined with kefir starter to create a nutritionally dense, probiotic rich, non-dairy, drink. Kefir is a starter culture made from gelatinous white or yellow particles called “grains”. The grains ferment the milk incorporating their beneficial yeast as well as friendly “probiotic” bacteria, to create the “cultured” product. The grains are then removed (by straining) before consumption and can be used again. The naturally occurring bacteria and yeast in kefir combine symbiotically (I love that word!) to provide excellent health benefits when consumed regularly. Kefir can be made from any type of milk, cow, goat, coconut, soy, or rice. For the lactose intolerant population that cannot digest cow or goat milk, kefir provides lactase, an enzyme that consumes the left over lactose after the culturing process. Therefore, lactose intolerance should not stop anyone from consuming kefir dairy products. What is the Difference Between Coconut Water and Coconut Milk? This one had me so confused. From what I’ve researched, coconut water is the liquid that comes from the young, green, coconuts. Coconut milk is derived from extracting the meat of the mature coconut which contains a lot of fat and calories. This fat is not as bad as it sounds though. Coconut oil is 92% saturated fat. Don’t freak out yet! 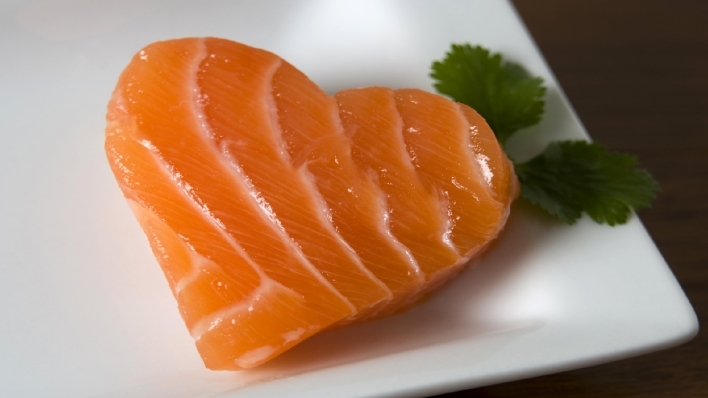 It’s approximately 65% (two-thirds) medium chain fatty acids (MFCA). Most all other fats and oils (saturated and unsaturated, plant or animal based) are mostly long chained fatty acids (LCFA). LCFAs are the fats that accumulate in your fat cells, and clogs your arteries. Your body needs pancreatic digestive enzymes and bile to digest LCFAs and they circulate in your entire body. MCFA rich coconut oil/milk does not need these enzymes or bile to digest. They are readily digested and go straight to your liver, boosting your metabolism. So now you want to know where to get coconut water kefir, right? Well, there are not a lot of companies out there that sell it already in its cultured state. You can purchase young, green, coconuts and use a kefir starter culture to make your own. Or pay a lot of money having it shipped to you from the handful of companies out there that make it. I found two sources of true coconut water kefir on the internet that I would trust. 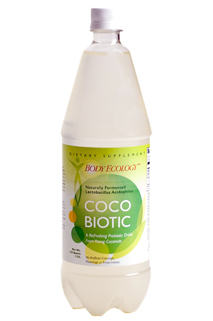 Body Ecology sells their brand of CocoBiotic beverage for $28.98 for a 44 oz. bottle and $14.95 for an 8 oz. travel size bottle. They also sell their starter culture packets if you want to buy young, green, coconuts and make your own coconut water kefir. A box of 6 packets cost $26.95 and each packet can be used an average of 7 times each. Their website is http://www.bodyecology.com. The other source that was brought to my attention is CocoKefir. This company was founded by Michael and Holly Larsen whose daughter was diagnosed with autism.They credit her recovery in part to the implementation of a biomedical approach to healing her gut first, which in turn helped heal her mind. They sell their 16 oz. CocoKefir bottle for $9.99. That’s $0.62 per ounce vs. Body Ecology’s 44 oz. bottle at $0.66 per ounce, and their 8 oz. bottle cost $1.87 per ounce. Their website is http://www.cocokefir.com. There is a third option out there. It’s not coconut water kefir, it’s cultured coconut milk. Remember the difference, water comes from young, green, coconuts and the milk is derived from the meat of mature coconuts. But the milk has the MCFAs, of which the water does not. 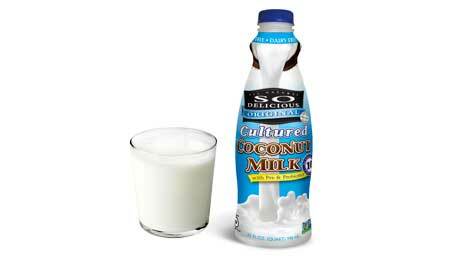 So Delicious makes Cultured Coconut Milk with prebiotics and probiotics, made from organic coconuts. They have original (unflavored), chocolate, strawberry and vanilla. The original one is best since it does not contain any added sugars that only feed the bad bacteria and yeast in our gut. A 32 oz. bottle sells for less than $4.00 and can be found at Whole Foods. You may find it in your local grocery store, but I’m not sure the cost. We have tried it and we have noticed benefits from drinking it. Digestion has improved, the obvious benefits from the prebiotics and probiotics, plus it gives us more energy. I like it mixed with a little orange juice, but my sons will only drink it in a smoothie. I know I’m adding fructose from the fruits I mix into it, but it still has helped them tremendously. I am purchasing a bottle of the Cocobiotic coconut water kefir and plan on seeing if we experience a true difference from drinking the So Delicious Cultured Coconut Milk. I’ll keep you posted on the results. If anyone has experience with these products or has other information to share, please comment below. 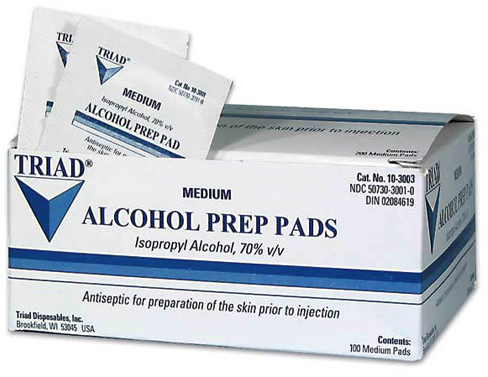 The FDA announced that Triad has issued a voluntary nationwide recall on all lots of alcohol prep pads, swabs, and swabsticks due to potential microbial contamination. (see link for FDA recall info) The pads are sold under the manufacturers’ name Triad and other companies like Walgreen and CVS to name a few. Shannon’s son had just been given his B12 shot using this alcohol pad to disinfect the area. That night he woke up and had nausea and vomiting with fever. These are the symptoms of a stomach virus and also of exposure to Bacillus Cereus. This bacteria is typically found in rare food poisoning outbreaks, and was found to contaminate the Triad prep pads, swabs and swabsticks forcing the recall. Needless to say, she was very concerned when she read the story on AOL that morning. She called the phone number on the box of prep pads to ask if it was in the recall and it was…even though it wasn’t on the list. The manufacturer will have the most updated list of products involved in the recall, so always check with them. 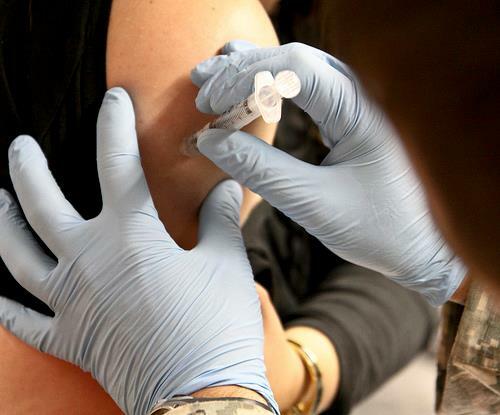 This bacteria would be devastating for people with compromised immune systems. Thankfully we do not purchase alcohol prep pads, even though they are very convenient. I prefer to use rubbing alcohol and a cotton ball to disinfect my son’s skin before a B12 shot. Please spread the word to people who give injections to themselves or a child; whether it’s someone with autism getting B12 shots, a diabetic or cancer patients. By the way, thankfully Shannon’s son recovered and is fine. But she still doesn’t know if it was a stomach virus or contamination from the prep pad. Want to know the really scary part? My friend’s pediatrician did not know about the recall and went to check their inventory immediately.